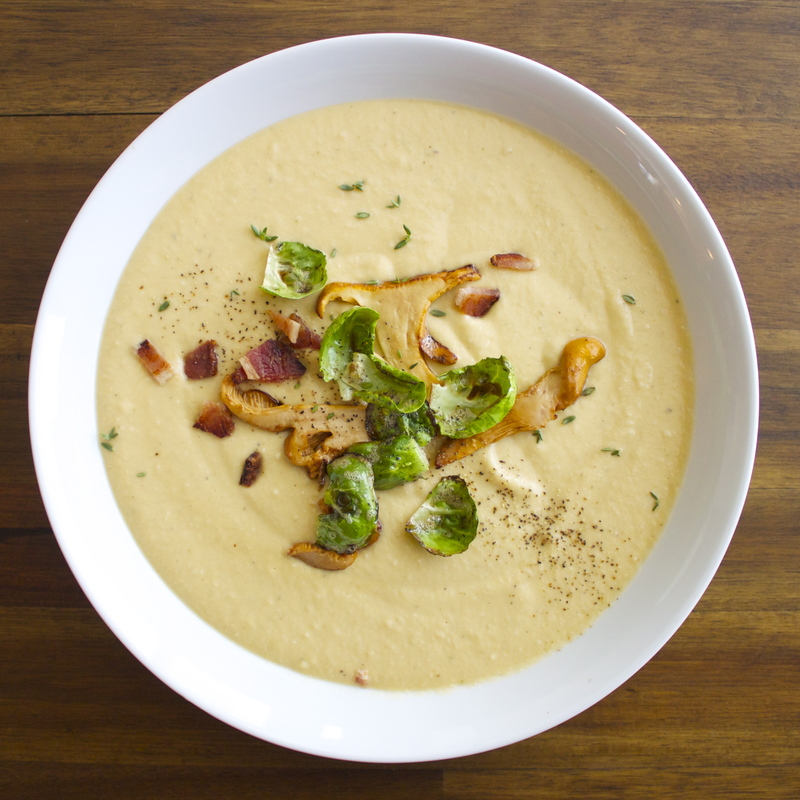 Last week, I made a cauliflower-based soup for the first time, and I’m officially hooked. This ingredient has so many things going for it—how had I never tried it before?! It’s such a great, healthy alternative to using potatoes as a way to thicken up a soup, and it also has a very neutral flavor that’s easy to bend to your will. For this recipe, I roasted the cauliflower with garlic and shallots, then simmered it with herbs and stock on the stovetop before blending it with some cashews to get some protein in there. It turned out fantastic. I don’t know why I’m always so surprised when something so simple turns into something out-of-this-world, but this was the most epic of pleasant surprises. The flavor was warm, full, and like a cozy blanket of a meal. I will definitely be adding this to my winter soup rotation. Soak cashews in water for 30 minutes. Drain. Chop cauliflower into 1 to 2-inch pieces. While cashews are soaking, in a large roasting pan, cook cauliflower pieces, garlic cloves, and shallots until they start to turn golden brown, about 30 minutes. In a large soup pot, bring stock to a boil. Pour in roasted vegetables, salt, tarragon, and thyme, then reduce heat and simmer until cauliflower is very soft, 20 to 30 minutes. In small batches, process in a blender until smooth. Add cashews to one of the batches and blend together. Pour batches into a large bowl until the pot is emptied, then pour soup back into the pot and return to stove until heated through. So, here’s the deal—this soup is amazing as-is. But, if you’d like to amp up the presentation a little, here are some options for garnishes. I used them all and they were great. But again, the soup is great without them, so totally up to you! 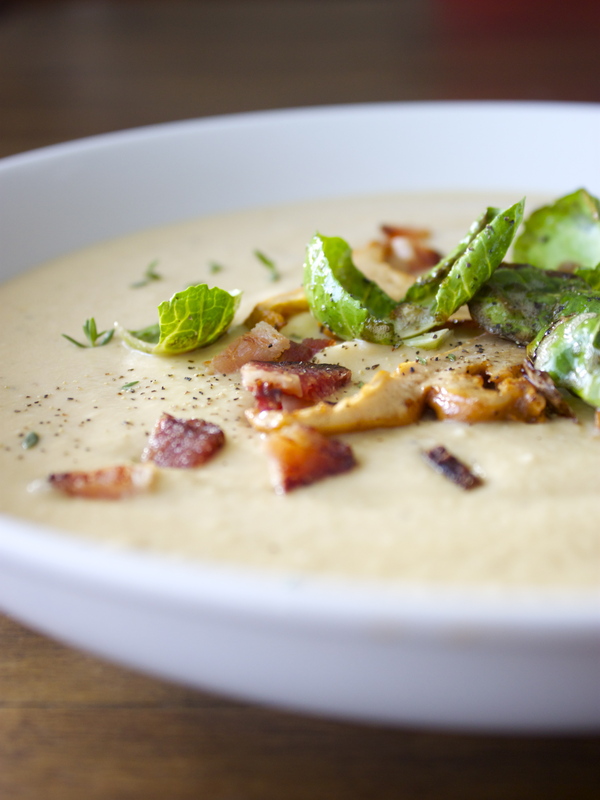 Bacon: (If you’re okay with a non-vegan version of this soup.) Cook in a large skillet over medium heat until crispy. Crumble and sprinkle over soup. Chanterelle mushrooms: Slice and cook over medium heat until softened, 3 to 4 minutes. Brussels sprout leaves: Peel the leaves of a handful of Brussels spouts apart and cook in a little oil in a large skillet over medium heat until crispy, about 5 minutes. 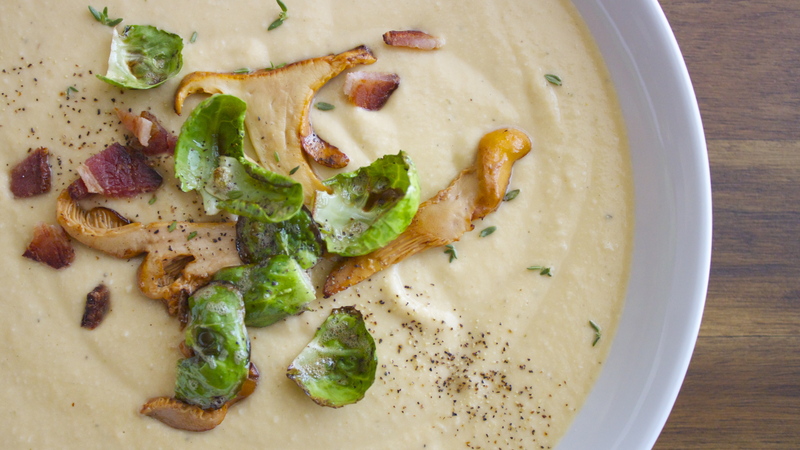 I made this soup for a Friendsgiving celebration—see the full menu here. Thank you so much! I still have one serving left that I plan on devouring tonight…it’s REALLY good!